The Exhibits have been kindly provided with permission of the author – the contents remain their property. If you have an exhibit to share, please contact Dr. Charles J. DiComo at charlesdicomo@gmail.com. Enjoy! Background: Located in the lower southeast section of Pennsylvania, Lancaster was the largest inland town in the colonies, but had to reply on postal facilities in Philadelphia where letters for settlers in the “back country” were advertised to be picked up. First references to a post office in Lancaster was in 1753 on a document “printed by S. Holland at the post office in King’s Street”. Samuel Holland published the Lancaster Gazette at that address. By 1756 advertised letters were being held at the post office in Lancaster. The town was fortunate to have one of the first turnpikes (Philadelphia to Lancaster and West) where post riders were gradually replaced by stage coaches to carry the mail. Records of Lancaster postmasters prior to 1790 are lost. In that year there were seventy-five Post Offices in the U.S., ten in Pennsylvania of which Lancaster was one. Objective: This exhibit is a study of the reported markings, rates and usages of Lancaster city from 1757 to 1899. 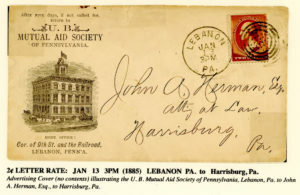 All known postmarks of the 1785-1899 period appear on this exhibit. Also several pre-1785 Parliamentary and Colonial covers are exhibited. Order of Exhibit: The exhibit follows the time line of reported townmarks. The townmarks are printed in blue for easier identification. Noteworthy Material: Material matted in blue is of special philatelic or historic interest. Background: Lancaster County, located in the southeastern section of Pennsylvania, was established in 1729 from portions of Chester County. The postal system evolved early in Lancaster County due to its proximity to Philadelphia and Baltimore ports. Early Pony Express and Stage Coach routes that gradually became the Philadelphia-Lancaster Turnpike gave Lancaster the distinction of being the largest inland town in the United States for many years. As the routes expanded so did the evolution of towns. The presence of a river helped establish towns along its banks and the ever pressing expansion north and west helped establish small towns along the way. The County also had many Indian settlements thus establishing trading posts that gradually became towns. Objective: This exhibit is an overview of postal history examples of Lancaster County towns. It includes manuscript, stampless and stamped cover examples from current towns and discontinued post offices. This exhibits does not include all Lancaster County towns or postal history. The towns are listed in chronological order by the year that the post office was established. The presence of a postal facility is essentially the result of towns being formed along the traveled paths and routes of earlier settlers. Covers shown in this exhibit are only examples of a few of the towns postal marking. The dates of the covers do not correspond to the establishment of the town or the post office. Postal rates and postmasters are listed for the date of the exhibited covers to increase the knowledge of the period and to show the progression of rates throughout the years. This exhibit cannot currently be considered for its philatelic expertise; however, it is an array of Lancaster County Postal History tidbits and information, and it is a work in progress. Noteworthy Material: Covers matted in green are of special philatelic or general interest. Numerous students of philately have extensively written about the cancellations and postmarks of New York City. A work relevant to this present study is that by Hubert Skinner (Philatelic Foundation Seminar Series #3, pp. 79-107). In his treatise, Skinner extensively and expertly discusses and describes the uses and postal history of cancellations and postmarks of NYC during the 1845 – 1876 periods. Importantly, a classification scheme incorporating code letters and numbers was introduced, denoting the type of marking, the year first recorded, and a serial number for that particular cancel – referred to as NYDM 52-3. This marking was one of many used on domestic inter-city letters. It is found in black and given the code NYDM 52-3, where the “NYDM” denotes “New York Domestic Mail”, the “52” denotes “first seen in 1852”, and the “3” denotes “type three”. So why revisit this cancel? First, the most compelling characteristic of this cancel is the usage of “APL” to abbreviate the month of April (Figure 1, left). Traditionally, April has most often been seen abbreviated prior to, during, and after the 1851-57 period by the three letters “APR” (Figure 1, right). 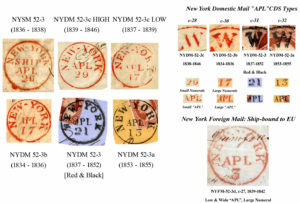 Second, some recently discovered “APL” covers and numerous re-examined “APL” singles demonstrate that the NYDM 52-3 cancel had a much broader period of use that once thought, being found on covers from the Stampless, Carriers, Locals, & 1847 Periods. 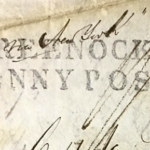 Finally, I will present evidence that more than one “type” or “sub-type” of canceling device was used to create the New York “APL” postmark. My years of searching have turned up over 150 folded letters, covers and/or stamps with the red or black “APL” circular date stamp. These are dated from 1834 up to and including 1855, a 21 year span of use. 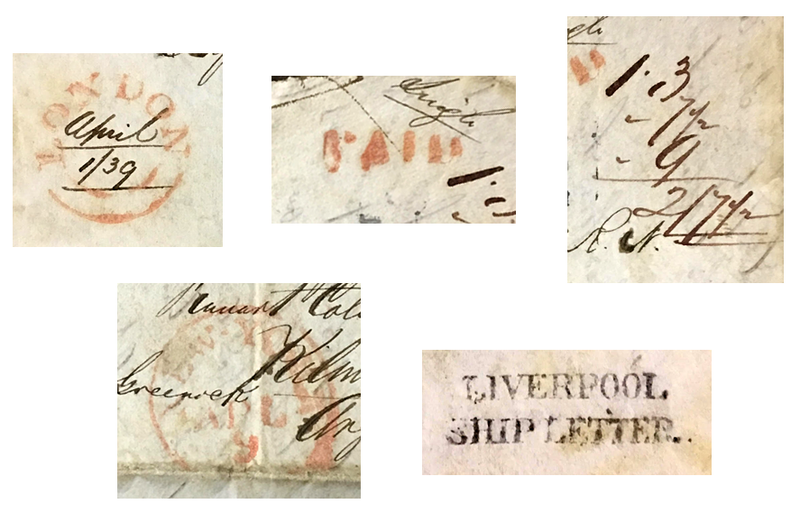 The red ink was predominant on Stampless and stamped letters up to 1851. Then starting in 1852 and continuing through to 1855, black ink was used for this NYC “APL” postmark. 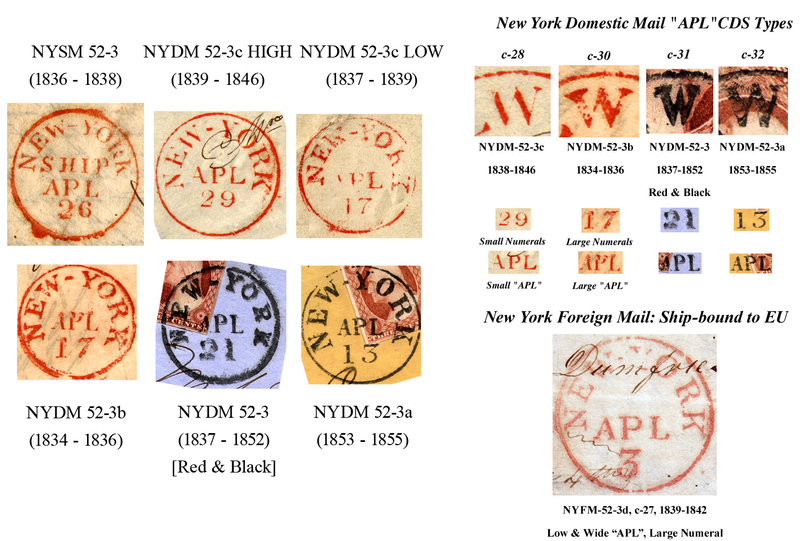 This exhibit analyzes the NYC “APL” postmarks on transatlantic stampless letters to foreign destinations. 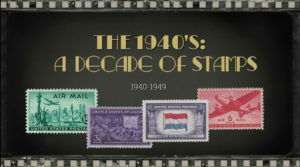 We are very pleased to bring you Tom Nichols Exhibition on the Stamps of the 1940’s, a decade which included the post-Great Depression era, World War II and the post-World War II era. 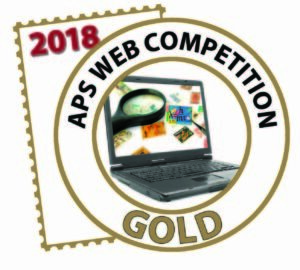 Tom wanted to accomplish an all-inclusive collection of the different types of postal material published over this varied decade of turmoil and new beginnings in order to better understand how U.S. philately was affected by those world events. He identified 15 different categories of postal material that can be collected and over 175 postal items issued. This exhibit highlights many of those different collecting categories and focuses on the great series of stamps and postal events that occurred during the 1940’s. You are also encouraged to visit the StampSmarter website, where this Exhibition is also available for viewing (The 1940’s: A Decade of Stamps). 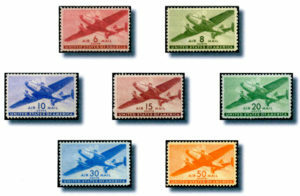 The U.S. Transport Airmail Issue of 1941-44 saw its heaviest use during the WWII period, with the 6 Cent Military Mail playing a large role in the history of this issue. 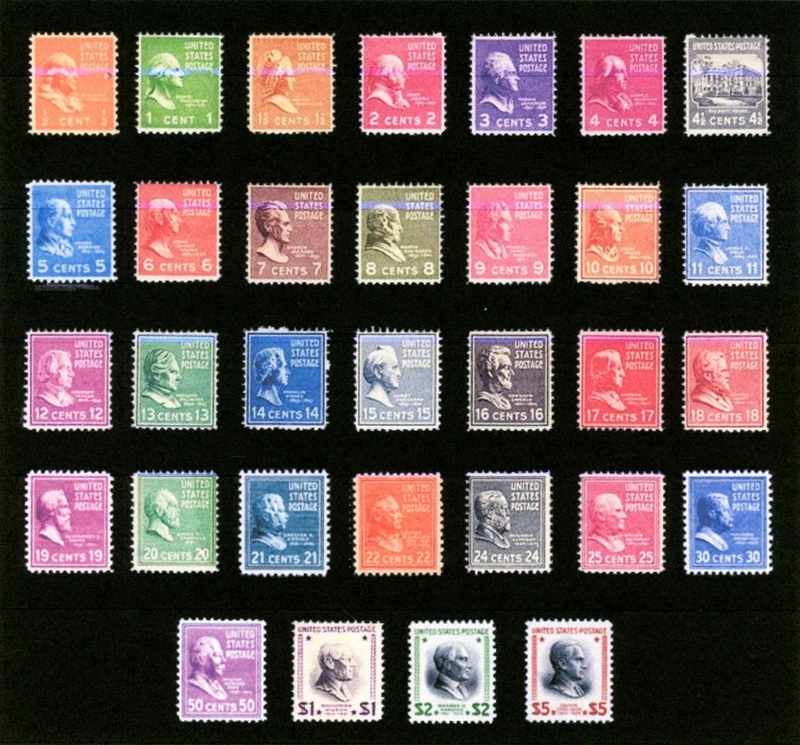 Stocks of these stamps were available for purchase at post offices through the mid-1950s. President Roosevelt signed a law on 13 December 1941 allowing for a “concessionary” rate of 6 cents per 1/2 oz. for mail to and from service personnel serving overseas. The rate cane in to force 25 December 1041. This rate was extended to civilian contractors and Allied forces serving alongside America forces. Mail had to be handled by a Military Post Office unit within an Army Post Office (APO), Fleet Post Office (FPO) or Allied Forces Unit (usually Canadian or British) connected to an APO/FPO to be eligible for this rate. International airmail rates were complex during this period. 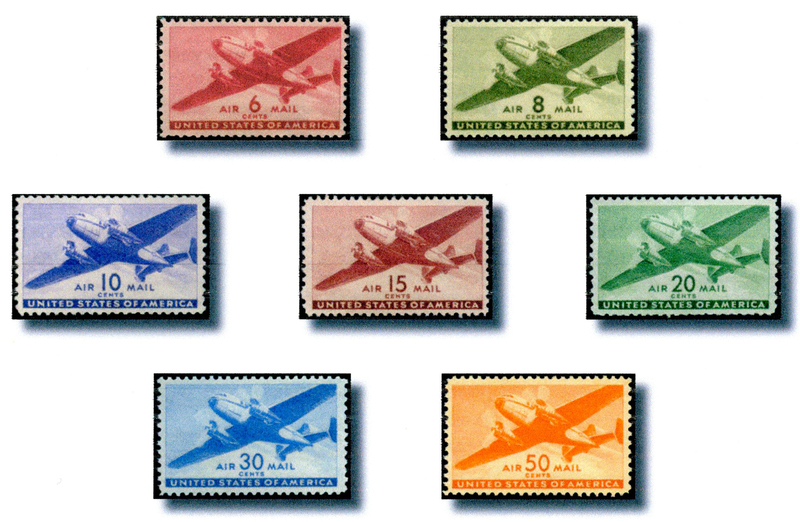 Rate confusion was solved when “Uniform” international airmail rates were introduced on 1 November 1946. This Exhibition illustrates rates and uses of the 1941-44 Transport Airmail Issue between 1941 and 1957. What follows is a new to postal history find – a folded letter written by Inspector General Colonel William G. Belknap to his wife Kate dated September 24, 1846 while he was at Camp Monterrey during the last days of the Battle of Monterrey during the Mexican-American War. He vividly describes the battles, his fellow officers by name killed or wounded in action, as well as General Worth’s heroism in taking the Town with limited losses. U.S. 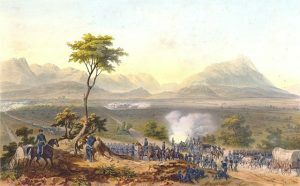 Troops March on Monterrey, Mexico, led by General Worth. The letter was sent to the provisional P.O. at Point Isabel, TX and cancelled with the scarce Type 1 handstamp, dated Oct. 4. From there it traveled via military transport vessel to New Orleans, LA and then sailed up to New York, where it was cancelled with a red Oct. 21-dated Newburgh circular date stamp (CDS). His wife had moved, so the folded letter was forwarded to Princeton, NJ. Total rate due upon arrival for the nearly one month journey was 15 cents. 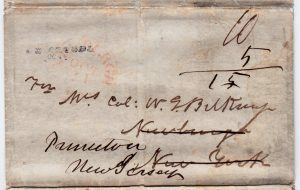 Folded Letter, Camp Monterrey Mexico to Point Isabel TX to New Orleans to Newburgh, NY to Princeton NJ, 10+5 rate, Sept. 24, 1846. Black “PT. ISABEL/OC 4” Type 1 handstamp & red “NEWBURGH/OCT/21/N.Y.” CDS. It is my pleasure to share a recent postal history find. I presented the 12 page mini-exhibit to the 100+ members and guests at the Annual Meeting, Open House and Exhibition of the Philatelic Society of Lancaster County (PSLC) on November 8, 2017. It is a Stampless-era Folded Letter Sheet (FLS) from London, Upper Canada with Canadian Rebellion-related contents to Kilmun, Scotland, 1839. 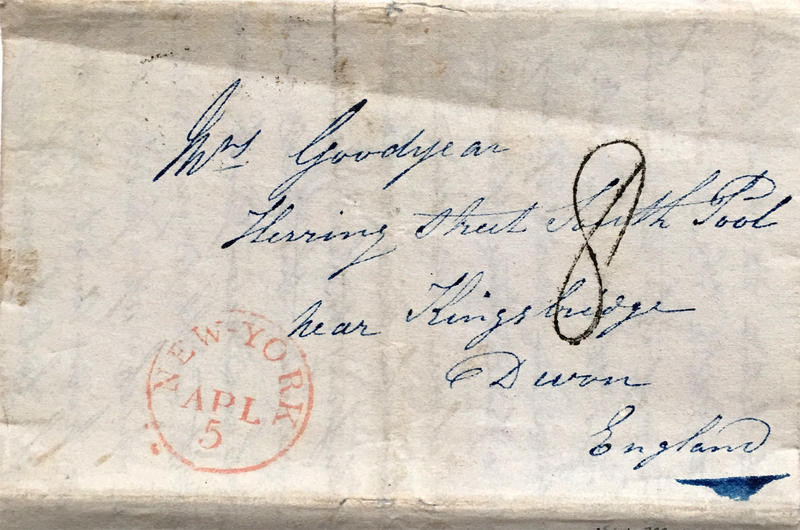 This letter entered the mails in London, Upper Canada (U.C. ); to New York City; via the sailing vessel “Virginian” to Liverpool, via coach to Glasgow; then Greenock; via small boat across the Firth of Clyde to Kilmun. The letter was written in London, U.C. on 31 March 1839. 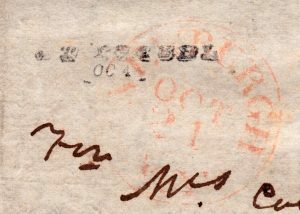 It entered the mails 1 April 1839 where the postal clerk added the red “LONDON” split-ring postmark with manuscript “April 1/39” and red “PAID”. The postage paid at London was 1s3 dcy (pence Canadian currency) for U.S. inland fee, 7½ dcy for sailing ship freight money fee, and 9 dcy for Canadian inland fee. This totaled 2s7½ dcy. 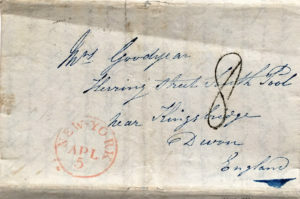 The letter traveled via the Eric Canal to Albany, down the Hudson River to Manhattan, where is received the New York City red “NEW-YORK APL 9” CDS (with the uncommon “APL” for April instead of “APR”). It was then placed in the mail carried by the Red Star Line sailing vessel “Virginian”, which departed New York harbor on 16 April 1839. After a 20 day transatlantic voyage, the letter arrived in Liverpool on 6 May 1839. 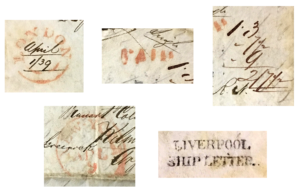 It was in Liverpool that the postal clerk added the two-line black “LIVERPOOL SHIP LETTER” on the reverse and wrote in pencil the postage due at destination of “1s8” (1 shilling 8 pence sterling) on the obverse (8p incoming shipfee plus 1sh inland fee from Liverpool to destination). 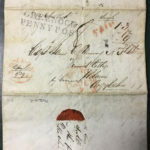 The letter the traveled ~240 miles north overland by coach to Greencock, Scotland, where the scarce two-line black “GREENOCK PENNY POST” marking was added. 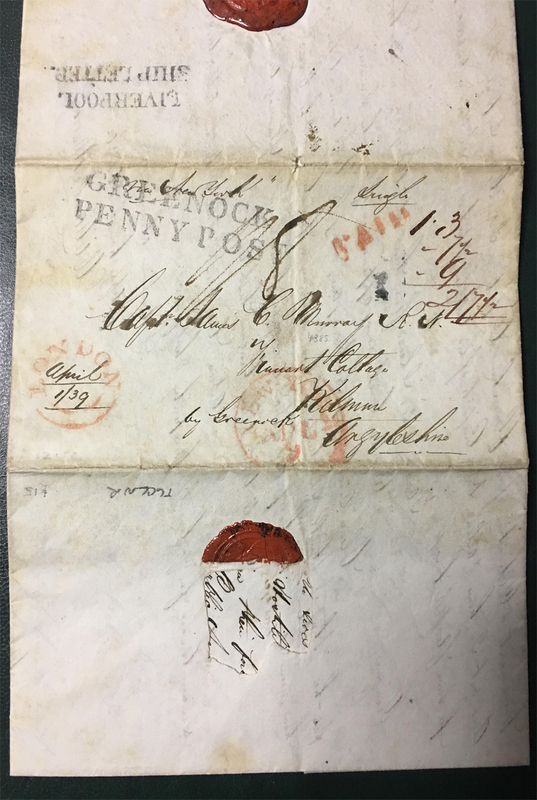 The letter was then transported by small boat across the Firth of Clyde to Kilmun, Scotland (a Receiving House for the Greenock Penny Post), where recipient paid 1s8p. 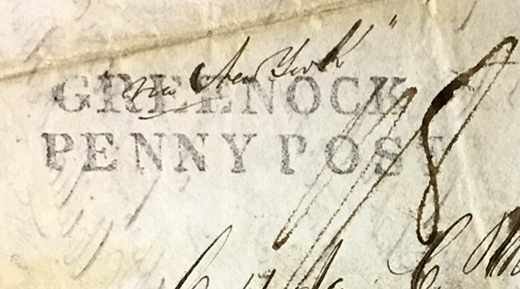 Kilmun had no known postmarks at the time, thus there is no receiving marking on the letter. The three page folded letter was sent from William Murray to his mother and father, the Captain James C. Murray, with a very detailed description of the Upper Canada Rebellion of 1838-1839 and New Brunswick – Maine border dispute (the Aroostook “War”). The objective of this exhibit is to highlight the two cent red brown issue of 1883, an issue that became the workhorse of the United States postal system at a time when the domestic postal rate was lowered from three cents, effective October 1, 1883 to two cents, but as early as August or September the Stamp Agency in New York City began to supply the new two cent stamps across the country. Under the date of July 18, 1883, the Third Assistant Postmaster General sent out a circular to all Postmasters announcing the new stamps, and their use. “On and after the first day of October, 1883, the rate of postage on domestic mail matter of the first class will be reduced from three cents to two cents per half ounce or fraction thereof, as provided by the Act of Congress approved March 3, 1883. The exhibit illustrates: double transfers, foreign reliefs, misplaced transfers, shifted transfers, evidence of palimpsests indicating the re-use and re-work of dies, damaged plate copies, progressive plate damages, un-erased plate layout lines and dots, position dots, line plate varieties, pierced- and non-pierced ear varieties, plate scratches, both constant and non-constant varieties. The exhibit is a select group of domestic and international postal history rates and usages. The rates are shown in a progressive and chronological order, breaking rates into their various service components demonstrating beginning and ending periods to illustrate their complexities. Auxiliary markings are demonstrated and explained. Foreign and Domestic Rates, including: Supplementary Rates, Postage Due, Prexies used in Lieu of Postage Due stamps, Special Delivery, Insured, Return Receipt, Avis Reception, Other Article, Forwarding, Paquebot, Return Mail, both rare and common are shown. Split-Rate Domestic and International airmail Contract and Treaty rates are presented. Military Postal Office Wartime and Peacetime Rates and Usages with Quartermaster Corp. Auxiliary Markings revealed. The covers shown from any Rate Group represents only a few examples of the total Rates & Usages of this postal history period. 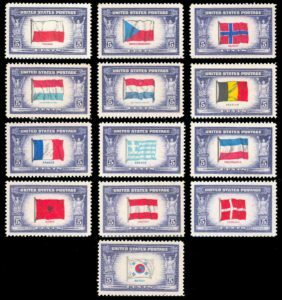 The Overrun Countries Series is comprised of 13 stamps, issued in tribute to countries overrun and occupied by the Axis powers, as follows: Poland, Czechoslovakia, Norway, Luxembourg, Netherlands, Belgium, France, Greece, Yugoslavia, Albania, Austria, Denmark, and Korea. 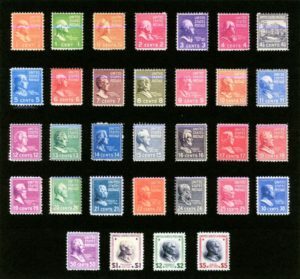 All of these stamps are of 5-cent denomination, 84/100 by 1 44/100 inches in dimension, arranged horizontally, and issued in sheets of 50 stamps each. The central subjects, which are surface printed, reproduce in natural colors the flags of the respective countries with the name of the country underneath. Rays of light extend from behind the central subjects to the outer frames. The main frames of the stamps, steel engraved, are printed in purple and depict on the left the phoenix, a mythological bird symbolizing the renewal of life, and on the right, in a corresponding position, a kneeling female figure portraying the breaking of the shackles of oppression and enforced servitude. Both figures are supported by pedestals on which, in oval-shaped panels with dark ground, the numeral 5 is indicated in white. These pedestals rest on a panel, in which appears the word “Cents” in white-faced Roman. Immediately back of the wording the panel is of a darker shade fading out at each end. Across the top of the stamps are the words “United States Postage” in white-faced Gothic, within a ruled panel with ornamental scroll ends. The Bureau of Engraving and Printing, Treasury Department, contracted with the American Bank Note Co., New York, N.Y., for printing of these stamps to take advantage of their special multi-color printing equipment.